1.2.2 Where are thumbnails of photos managed by f-spot stored? 1.2.3 How does f-spot class photos? The project is dead F-Spot was removed from deposits official since Ubuntu 16.04. See this report bug . 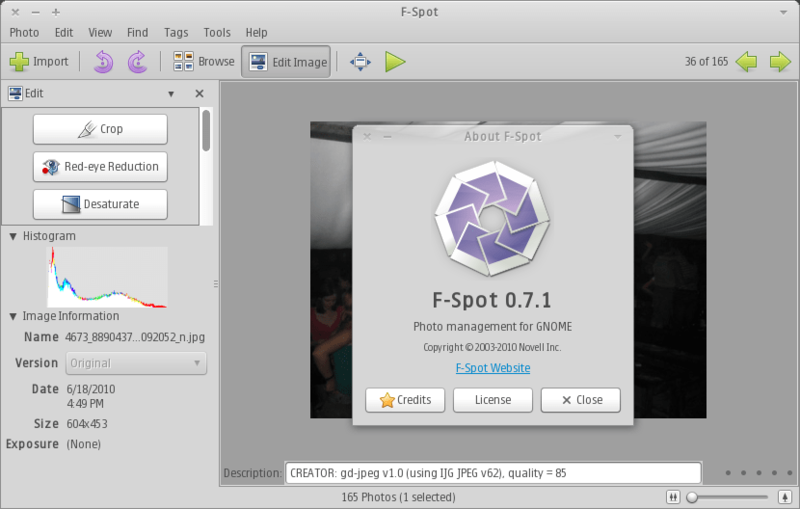 F-Spot is a manager of personal photos, single-user (we must take precautions before moving his collection of photos ), for GNOME . It is written in C # and using Mono and Gtk #. JPEG, GIF, PNG, SVG, CR2, NEF, PEF, RAW, TIFF, ORF, SRF, DNG, CRW, PPM, MRW, RAF, BMP). It supports tag management (search by keyword), EXIF and XMP metadata. It has editing functions (rotation, cropping, red-eye treatment …) and color adjustment (colors, brightness, contrast, tone, saturation, temperature). It finally allows exports to the Web ( Flickr , 23 , Picasa Web , SmugMug , Facebook and creating a web gallery to browse a collection of photos by tag in particular). This section applies only to versions before Ubuntu 16.04. This means that the photo has been moved or deleted manually. Where are thumbnails of photos managed by f-spot stored? The thumbnails are stored in the hidden folder .thumbnails your personal folder. It is thus “useful”, when you save your photos, to also save this directory (as well as the f-spot configuration directory). Otherwise, after a reinstallation, the thumbnails will automatically re-create each time you view a series of photos causing slowness at the time of the display. How does f-spot class photos? ⇒ Pictures folder ⇒ year folders ⇒ month folders ⇒ days folder. When you re-install a version of Ubuntu (not an upgrade), you back up your photos but when you import them to the f-Spot version of your new installation, it will not recompose the label organization (It stores them in imported label) and there it is the drama. Then copy the file from the old system of labels (photos.db file) in the folder hidden .config / f-spot .